speaks tons about you. 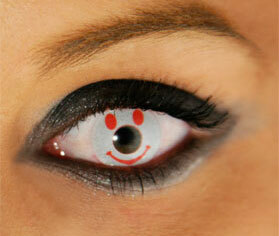 Be happy all day long with Smiley lenses available at cococontacts.com. Flash everyone a wild smile with a mere glance with Coco Contact’s Wild Smiley lenses. With a bright red smiley face right smack in the center of your eye, no one would be able resist taking a look. It’s available in yellow too for those who want a vibrant golden smile. Purchase a pair now only at cococontacts.com.